QTLs associated with ABA content in triticale anthers were analysed using the population of 72 DH lines derived from F1 cross between inbred line ‘Saka 3006’ and cv. ‘Modus’. Using Windows QTL Cartographer and MapQTL 5.0 softwares, composite interval mapping (CIM) and association analysis (Kruskal–Wallis test) for ABA content before and after low temperature treatment inducing androgenic development were conducted. The concentration of ABA in freshly cut tillers varied from 0.8 to 2.2 nmol g−1 DW. Intensive ABA accumulation (up to 5.3 nmol g−1 DW) was observed in response to low temperature stress. No correlation between ABA concentration and androgenesis induction efficiency was detected, whereas negative correlation (up to r = −0.33) was found between concentration of ABA in anthers collected from cold treated tillers and regeneration ability. CIM analysis indicated one QTL localized on chromosome 5A (LOD = 2.5; R2 = 9.3 %) associated with ABA concentration in unstressed plants and four QTLs on chromosomes 2A, 1B and 5R (LOD 2.6–5.7; R2 = 9.5–24 %) regulating ABA accumulation in response to low temperature stress. The Kruskal–Wallis test revealed significant (p < 0.01) association with markers localized on chromosome 4A, 5A and 2RS.3R for unstressed plants and on chromosomes 3A, 3B, 5B and 2RS.3R for low temperature treated plants. The process of androgenesis is an example of plant cell totipotency during which immature cells of the plant’s male gametophyte (microspores) switch from the gametophytic to the sporophytic pathway of development. As a result, instead of mature pollen grains, haploid androgenic structures which resemble zygotic embryos and mimic zygotic embryo development are formed. Regenerated haploid plants and the so called doubled haploids (DH) produced from them have been advantageous in many research areas such as molecular mapping, genomics, transformation, mutation and breeding. It is a well-known fact that the main factor responsible for the change of microspore developmental pathway is stress treatment (Touraev et al. 1997). Surprisingly, various stress factors like high or low temperature, starvation or osmotic stress can act as equivalent triggers for androgenesis induction (Zoriniants et al. 2005), suggesting a rather unspecific mechanism of its action. Among them, low temperature treatment applied to excised inflorescence, flower buds or anthers was effective in many plant species, e.g. triticale (Immonen and Robinson 2000, Pauk et al. 2000, Wędzony 2003, Zur et al. 2008). It has also been proved that androgenic development is controlled by the plant’s genome but could be significantly modified by many environmental factors influencing physiological state and condition of the donor plant. One of the most important factors determining androgenesis effectiveness is the endogenous level of growth regulators (Wang et al. 2000, Gorbunova et al. 2001; Wassom et al. 2001). Genotype variation of this trait could be the reason for different responses to plant hormones which are applied to the induction medium. However, hormonal composition of the medium is usually designed experimentally without deeper insight into endogenous/exogenous hormone balance and its influence on the course of androgenesis (Delalonde and Coumans 1998, Wang et al. 2000, Gorbunova et al. 2001). Abscisic acid (ABA) is the hormone involved in many physiological processes during plant growth and development. It is present in the plant organism at each developmental stage, starting from seed germination, through growth, flowering and fruit set, ending with dormancy and plant death. Among others, it regulates the expression of genes controlling the synthesis of late embryogenesis abundant (LEA) proteins (Marcotte et al. 1988; Gomez et al. 1988; Harada et al. 1989). A stimulating effect of ABA on somatic embryogenesis has been observed in in vitro cultures of many monocots (Rajasaran et al. 1987a, 1987b; Close and Ludeman 1987; Carman 1988; Brown et al. 1989; Fernando and Gamage 2000) and dicots (Zdravkovi’c-Kora’c and Neškovic 1999; Senger et al. 2001; Nishiwaki et al. 2000; Kiyosue et al. 1992; Kuo et al. 2002). ABA also plays the key role in the plant’s adaptation to various environmental stresses, e.g. drought, (Wilkinson and Davies, 2002), prolonged darkness (Vaughan and Bate 1977), flooding (Zhang and Davies 1987; Jackson 1994), osmotic stress (Weiler et al. 1982), starvation (Radin et al. 1982), low temperature (Gusta et al. 2005) and pathogen attack (Cao et al. 2011) as well as in cross-tolerance to various stresses (Cutler et al. 2010; Pastori and Foyer 2002). The fact that stress treatment is the trigger for androgenic development suggests ABA involvement in microspore switch toward sporophytic pathway (Imamura and Harada 1980; Reynolds and Crawford 1996; Van Bergen et al. 1999; Wang et al. 1999; Guzman and Arias 2000). It has been confirmed that ABA accumulation is under control of several genes and is inherited in a quantitative manner (Quarrie 1981, 1990). In recent years, results of QTL mapping for ABA accumulation in association with stress tolerance have been reported several times (Quarrie et al. 1997; Iuchi et al. 2002; You 2006). However, up to now the genetic basis of the role of ABA in androgenic development has not yet been studied. In this study, the ‘Saka 3006’ × ‘Modus’ DH mapping population of hexaploid winter triticale (×Triticosecale Wittm.) together with its recently produced well-saturated genetic linkage map (Tyrka et al. 2011) were used to localise QTLs and to identify markers associated with ABA accumulation in triticale anthers. The 72 DH lines used in the experiment were selected as significantly different in their androgenic responsiveness tested by anther culture method and stable in their effectiveness of androgenesis induction. Triticale spikes were cut when the majority of microspores were at the late uni-nucleated phase of development—optimal for androgenesis induction—and cold-treated for 3 weeks at 4 °C. Then the anthers were isolated and transferred to in vitro culture conditions to estimate the efficiency of androgenesis induction. The ABA analysis was conducted on anthers isolated from freshly cut tillers and from low temperature-treated tillers in which a great number of microspores had turned toward sporophytic development. The fact that the triticale population used was originally produced for drought resistance molecular mapping suggests that selected parental genotypes varied significantly with respect to endogenous ABA level and allows us to presume that its progeny segregate significantly. The seeds of 72 DH triticale lines derived from F1 generation of a cross between inbred line ‘Saka 3006’ and cv. ‘Modus’ as well as both DH parental lines were kindly provided by Dr Eva Bauer from the State Plant Breeding Institute, Hohenheim University in Stuttgart, Germany. Germinating seeds after 2 days in the dark at room temperature were placed in perlite pre-soaked with Hoagland’s salt solution and vernalized for 7 weeks at 4 °C and 8 h/16 h (day/night) photoperiod. Then the seedlings were planted into pots containing a mixture of soil, de-acidified substrate peat and sand (2/2/1; v/v/v) and grown at 20 ± 2 °C, 16 h/8 h (day/night) photoperiod until flowering. Additional illumination (Philips 400 W Son-T Agro High Pressure Sodium Lamp) was applied to prolong the light period or as supplementary light during unfavourable weather conditions. The protocol for androgenesis induction and plant regeneration has been described by Wędzony (2003) and used with several modifications. One of them was that the low temperature treatment applied to collected triticale tillers was prolonged from 2 to 3 weeks. The hormonal composition of C17 induction medium (Wang and Chen 1983) was also modified and supplemented with 0.5 mg L−1 Kinetin, 1 mg L−1 Dicamba and 1 mg L−1 Picloram. For medium gelification 0.6 % agar instead of agarose was used. The cultures were incubated in the dark at 28 ± 1 °C. In the regeneration procedure low temperature stage was omitted. Regeneration phase took place at 26 °C, in the light (at about 30 μmol m−2s−1 during the first week, then increased to 80–100 μmol m−2s−1) with 16 h/8 h (day/night) photoperiod. The samples (anthers with total weight 0.3 g) were taken from freshly cut tillers (control; C) and after low temperature treatment for 3 weeks at 4 °C (LTT) inducing the process of androgenesis. Plant material was freeze-dried and the samples were ground with ball mill MM400 (Retch, Germany) in Eppendorf vials, to which 1.5 ml of cold distilled water was then added. The vials were then placed in boiling water for 3 min and shaken overnight at 4 °C. The next day the extracts were centrifuged for 20 min in a refrigerated centrifuge at 18,000×g (MPW-350R, Poland). ABA was measured in the supernatant using indirect enzyme-linked immunosorbent assay (ELISA) according to Walker-Simmons and Abrams (1991). The antibody used was MAC 252 (Babraham Technix, Cambridge, UK). Absorbance was measured by microplate reader Model 680 (Bio-Rad Laboratories, Inc.) at the wavelength of 405 nm. For each treatment, at least four independent ELISA measurements were made on two independent samples collected from four to six different plants. There were two separate replications of the experiment. 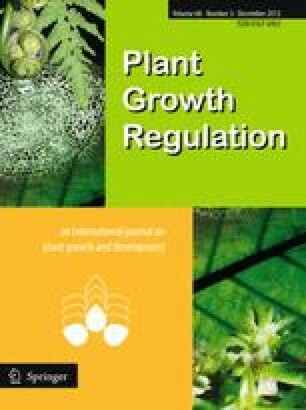 For each replication, several parameters describing the effectiveness of the induction and regeneration phases were calculated, namely: AS/100A—the number of androgenic structures produced per 100 anthers of the donor plant; R/100AS—total number of regenerants per 100 androgenic structures transferred to regeneration medium; GR/100AS—the number of green regenerants per 100 androgenic structures transferred to regeneration medium; R/100A—total number of regenerants per 100 isolated anthers; GR/100A—the number of green regenerants per 100 isolated anthers. Each dish containing 100 anthers collected from one spike was assumed to be a replicate. For the majority of DH lines mean values were calculated from six replicates. Statistical analysis of the results was performed using Statistica version 8.0 (StatSoft, Inc. USA). The normal distribution of scores was verified by Shapiro–Wilk test to validate the use of parametric tests. The effect of tested variable/variables was examined by multi-factor analysis of variance (ANOVA). Post hoc comparison was conducted using Duncan’s multiple range test (p ≤ 0.05). The relationship between segregations of single marker and trait was analyzed with the Kruskal–Wallis test (K–W) using MapQTL 5.0 package (Van Ooijen 2004). Linkage analysis was performed using the composite interval mapping (CIM) method with Windows QTL Cartographer version 2.5 (Wang et al. 2007). Threshold LOD scores were calculated by 1,000 permutations. The percentage of phenotypic variation was calculated with a single factor regression (R2). The CIM and Kruskal–Wallis test analyses were performed separately for each experimental replication. Significant variation in all components of androgenic responsiveness (androgenic structure induction, total plant regeneration and green plant regeneration ability) was observed between parental genotypes and among their F1 cross derived offspring population. The mean androgenesis induction efficiency (AS/100A) of DH ‘Modus’ was more than two times higher in comparison with DH ‘Saka 3006’ (Table 1). Thus, although mean total and green plant regeneration abilities were similar for ‘Saka 3006’ and ‘Modus’ (10.5 versus 13.6 R/100AS and 4.6 versus 5.5 GR/100AS, respectively), the values of parameters characterizing final androgenesis efficiency (R/100A and GR/100A) for paternal genotype ‘Modus’ were 3.5 times higher than for ‘Saka 3006’. In the studied DH progeny population a much wider variation with extremes significantly exceeding characteristics of parental genotypes both in plus and in minus was observed (Table 1). Variation analysis showed significant influence (p ≤ 0.001) of both genotype and low temperature tillers treatment on ABA concentration in anthers of 72 triticale DH lines. The effect of interaction between variables was also significant (Table 2). The results received for parental genotypes and the population of their progeny is shown in Table 3. Statistical analysis (Duncan test, p ≤ 0.05) did not indicate significant differences between parental DH lines with respect to ABA concentration in anthers isolated from freshly cut tillers. However, they varied dramatically in their reaction to low temperature treatment (3 weeks at 4 °C). In anthers of the maternal genotype ‘Saka 3006’ ABA concentration did not change significantly (23 % increase of the initial value), whereas in anthers of ‘Modus’ ABA concentration increased almost three times in comparison with the value of control plants (Table 3). In the studied DH population very large variation was observed for both examined traits (Table 3). The concentration of ABA in freshly cut tillers varied from 0.8 to 2.2 nmol g−1 DW with a population mean of 1.41 nmol g−1 DW—almost identical with that of the paternal genotype ‘Modus’. Generally, in the studied population low temperature treatment significantly increased ABA concentration, with a mean increase of 1.5. The range of variation (from 1.1 to 5.3 nmol g−1 DW) in ABA concentration among DH population exceeded the variation between parental genotypes. The distribution of both traits was near to normal, skewed slightly towards the lower part of the frequency scale (Fig. 1). However, as no procedure of data transformation resulted in more normal distribution, the original data was used for further analysis. The mean results for all DH lines are shown in Fig. 2. Correlation analysis did not show significant association between ABA concentration in anthers isolated from freshly cut tillers and androgenesis induction efficiency (AS/100A; Table 4). Similarly, the effectiveness of androgenesis induction was related neither to ABA concentration in anthers isolated from low temperature treated tillers nor to the increase of ABA concentration (ΔABA) in reaction to low temperature treatment. Moreover, weak/moderate but statistically significant negative correlation (r = −0.31 to −0.33) was found between concentration of ABA in anthers collected from cold treated tillers and regeneration ability (GR/100A, R/100AS). QTL analyses were performed separately for each replication but here only consistent results are presented, confirmed in both experiments. QTL analysis detected quite different localization of genes associated with ABA concentration in anthers collected from control, non-stressed and cold-treated tillers. CIM analysis localized only one QTL associated with ABA concentration in control plants and four QTLs regulating ABA accumulation in response to low temperature stress. All chromosome regions detected by CIM method were confirmed by the Kruskal–Wallis test (p < 0.01) as carrying markers significantly associated with the studied traits. Loci associated with ABA concentration in anthers collected from control plant were localized on the fifth chromosome of wheat subgenome A (Table 5). It explained about 9 % of the phenotypic variation and the positive effect originated from ‘Modus’ allele. The Kruskal–Wallis test revealed an additional significant (p < 0.01) association with markers localized on chromosome 4A and two more on chromosomes 5A and 2RS.3R (Table 6). QTLs controlling ABA accumulation in response to low temperature treatment were identified on chromosomes 2A, 1B and 5R (Table 5). The highest effect (LOD 5.7 and R2 23.8 %) came from QTL on chromosome 5R and only in this case ‘Saka 3006’ allele increased the value of the trait. The most likely position of genes significantly (p < 0.01) associated with the trait was the interval between rPt-505701 (97.2 cM) and rPt-400221 (98.2 cM) markers. Despite lower LOD value (2.6–3.1), two QTLs mapped on chromosome 2A flanked by the marker loci Xwmc522–Xgwm0372 and tPt-8937-wPt-3244 as well as one QTL on chromosome 1B between wPt-4129 and rPt-5412 loci were detected consistently by both analytical methods and explained 9.5–13.3 % of the phenotypic variation (Table 5). The Kruskal–Wallis test identified additional significantly (p < 0.01) associated markers on chromosomes 3A, 3B, 5B and 2RS.3R, details shown in Table 6. The hypothesis suggesting an involvement of ABA in microspore reprogramming and androgenic development has been put forward in a number of reports. Strong positive correlation between ABA concentration and microspore viability has been detected in isolated microspore cultures of barley (Van Bergen et al. 1999; Wang et al. 1999). Moreover, the number of binucleated microspores was diminished suggesting an involvement of ABA in the repression of gametophytic development (Van Bergen et al. 1999). Similarly, Reynolds and Crawford (1996) reported significant correlation between ABA accumulation and the expression of early cysteine-labeled metallothionein gene, which was considered the marker for an early phase of androgenesis induction. The role of ABA in the activation of mitogen-activated protein kinase cascades initiating microspore divisions and differentiation was also suggested (Préstamo et al. 1999; Liu 2012). Positive effect of ABA has been observed in androgenic cultures of tobacco (Imamura and Harada 1980; Kyo and Harada 1985), barley (Van Bergen et al. 1999), wheat (Hu et al. 1995) and rice (Guzman and Arias 2000). Moreover, inhibition of ABA synthesis significantly decreased the effectiveness of androgenesis (Hoekstra et al. 1997; Reynolds and Crawford 1996). Our earlier investigations indicated that triticale varieties differing in androgenic responsiveness also significantly differ in endogenous ABA level (Żur et al. 2008). Viability of microspores isolated from freshly cut tillers of the cultivar with low endogenous ABA rapidly decreased during the first days of in vitro culture. Microspores of the cultivar with relatively high ABA concentration were more tolerant to the stress associated with isolation and transfer to in vitro culture, which resulted in higher effectiveness of androgenesis induction. A significant increase in ABA concentration in response to low temperature treatment was observed in anthers of the tested triticale DH lines. This reaction is a very typical biochemical response to a wide spectrum of stress factors. Similar to the results obtained on wheat by Ji et al. (2011), the parental genotype more tolerant to drought (‘Saka 3006’) accumulated less ABA in comparison with the more sensitive genotype (‘Modus’). Such a result seems to confirm the hypothesis of Imamura and Harada (1980) that androgenesis induction requires a specific threshold of ABA level. The positive influence of ABA could be explained by increased activity of antioxidative system protecting isolated microspores during transfer and first days of in vitro culture. Such effects as increased level of hydrogen peroxide (H2O2), stimulation of antioxidative enzyme activity as well as low-molecular antioxidant compounds accumulation were observed in response to exogenous ABA application (Jiang and Zhang 2001; Agarwal et al. 2005). However, the results received in the present study did not confirm direct linear correlation between the efficiency of androgenesis induction (AS/100A) and ABA concentration in triticale anthers. This concerned both anthers collected from freshly cut tillers of control plants growing in physiologically optimal glasshouse conditions and anthers collected from tillers at the end of androgenesis-inducing cold-temperature treatment (3 weeks at 4 °C). Surprisingly, weak/moderate but significant negative correlation between the concentration of ABA in anthers collected from cold-treated tillers and both parameters of regeneration efficiency (GR/100AS, R/100AS) was detected. It seems that higher ABA concentration not only did not influence microspore reprogramming but had a negative effect on androgenic structure formation and regeneration ability. A similar negative ABA effect was observed in anther culture of Brussels sprouts (Biddington et al. 1992). It was also reported that male sterility in rice induced by low temperature was associated with intensive ABA accumulation (Oliver et al. 2007). The same correlation was noted in the case of drought-induced male sterility in wheat (Ji et al. 2011). Moreover, it was proved that ABA spike treatment mimics the effect of cold and drought causing plant sterility. The mechanism of ABA action was connected with the repression of OsINV4, the anther wall invertase activity regulator, and the reduction of anther sink strength (Oliver et al. 2005, 2007). The results of QTL analysis indicate quite different localization of genes controlling ABA content in anthers collected from plants growing in physiologically optimal conditions in comparison with cold-stressed plants. QTL analysis confirmed the location of gene(s) associated with ABA concentration in non-stressed conditions on chromosome 5A with the most likely position in the region flanked by loci Xcfa2163 and Xgwm0595. Chromosome 5A was earlier indicated as carrying genes regulating drought-induced ABA accumulation in wheat leaves (Quarrie et al. 1994). At present, it is not possible to determine if these QTLs associated with ABA concentration in triticale and in wheat are related. Precise comparative mapping is problematic, as none of markers located on the linkage map used by Quarrie et al. (1994) were present on the genetic map of triticale (Tyrka et al. 2011) which was applied in our study. Interestingly, one of markers linked with accumulation of ABA in wheat (Xpsr426) is located on the integrated map of chromosome 5A in the close vicinity to the locus Xcfa2163 (Singh et al. 2007), so it is not excluded that QTL detected in the present study is in fact the gene reported formerly by Quarrie et al. (1994). Nearby on the same chromosome, Sutka and Snape (1989) identified major loci of genes associated with frost tolerance. According to these authors, the possible function of this/these gene(s) is connected with the modification of cell membrane structure or function. The results of the Kruskal–Wallis test gave strong evidence for genes regulating ABA concentration in anthers of triticale control plants to be present on chromosome 4A. In cereals, the same chromosome has been identified as the most deeply involved in embryo sensitivity to ABA and seed dormancy (Noda et al. 2002). Several different studies also identified chromosome 4A as carrying loci determining seed dormancy (Kato et al. 2001; Mares et al. 2005; Torada et al.2005) and pre-harvest sprouting (Chen et al. 2008) and it is well known that both traits correlate with ABA sensitivity level. The triticale genes controlling ABA accumulation induced by low temperature treatment were identified on chromosomes 2A, 3A, 1B, 3B, 5B 2RS.3R and 5R. Previously cited studies (Quarrie et al. 1994) of QTLs associated with drought-induced ABA production also suggested chromosome 3B as a place of their localization. According to Noda et al. (2002) genes determining ABA sensitivity were localised on chromosomes 2B, 3B, 5A, 5D, 6B, 6D and 7D. Presumably, the loci were situated on chromosome 3B as possessing genes controlling seed dormancy. Also the results of the study examining rye grains responsiveness to ABA (Milczarski and Masojć 2002) support our data as the QTLs controlling the trait were identified on chromosomes 1RS, 2RS and 5RL, with the last one having the strongest effect. In the studied triticale DH population, among QTLs associated with ABA concentration in control plants, two regions on chromosome 5A located very close to locus QASsm-5A-1 determined androgenic induction ability Krzewska et al. (in press). Next two loci on chromosome 4A were situated nearby locus QGRASsm-4A-2, which was associated with green plant regeneration efficiency, whereas locus on chromosome 5R was localized nearby loci regulating final androgenesis effectiveness expressed in total (R/100A) and green (GR/100A) regenerants number [rPt-506739, rPt-505701, and Xrems1063, rPt-400221 respectively; Krzewska et al. (in press)]. In conclusion, the obtained results show ABA accumulation in response to stress treatment induces androgenic development. Increased ABA concentration could sustain microspore viability by an improvement of its tolerance or adaptation to the stress connected with isolation procedure and transfer to in vitro culture as it was suggested by Imamura and Harada (1980). However, the lack of correlation between ABA accumulation and androgenesis induction efficiency together with negative correlation with androgenic structure regeneration ability suggest complex, non-linear character of the relation with specific thresholds of positive effect. On the other hand, another explanation can also be suggested: close location of genes having a major effect on ABA accumulation and controlling androgenesis effectiveness could be the reason for the observed association without direct physiological relationship between both traits. To draw more detailed conclusions, an in-depth analysis with the use of exogenous/endogenous ABA balance manipulation is necessary. The research was conducted in the frame of COST Action FA0604 ‘Triticeae genomics for the advancement of essential European crops (TritiGen)’ and supported by the Polish Ministry of Science and Higher Education (research project 548/N-COST/2009/0).